There are several reasons dogs like to chew. Puppies use their mouths to explore and learn about the world – and chewing relieves pain from teething. Adult dogs chew to keep their jaws strong and teeth clean, or to combat boredom. Some dogs chew to relieve frustration or anxiety. 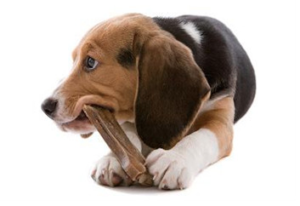 Puppy chewing usually ends at around six months of age. You won’t be able to stop your puppy from chewing, so try to redirect the focus to appropriate objects – and put things that absolutely shouldn’t be chewed out of reach. Some people give puppies ice cubes to chew. There are special dog toys that can be frozen, and the chill can help relieve the pain from teething. Adult dogs also need to chew – it’s a normal behavior. Make sure they have appropriate and attractive chew toys, and give praise when they chew the right things. Dogs don’t know what’s okay and what isn’t okay, and it’s up to us humans to teach them. It’s a good idea to observe what type of toys keep your dog occupied for a long period of time, and to rotate toys. They get bored with things just like we do. If your adult dog chews – and maybe destroys things – when left alone, the reason might be separation anxiety. Especially if the chewing is accompanied by other behaviors such as barking, whining, pacing, and restlessness.